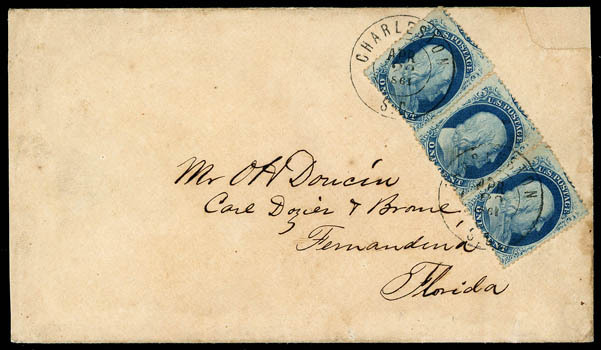 Confederacy, Charleston S.C., Apr 22, 1861, two strikes of cds tie U.S. 1¢ blue (24) pair and single, on cover to Fernandina, Florida; upper right corner repair, Very Fine appearance and scarce 1¢ Confederate use. 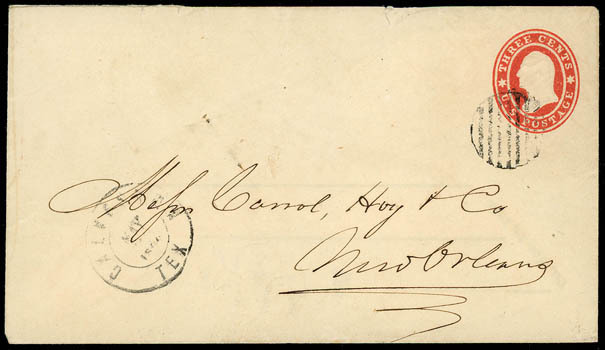 Confederacy, Galveston Tex, May 24, 1861, cds (1860 slug) and matching grid cancel on U.S. 3¢ red (U26) Star Die entire from the Carroll & Hoy correspondence to New Orleans La. ; usual filing holes, flap tear and tiny edge tear, Very Fine. Scott No. US #U26 Estimate $300 - 400. Although the year slug in the cds appears to be 1860, the 3¢ star die entires were not issued until after the summer of 1860. The earliest known use of a star die entire is August 18th 1860 from Burlington N.J. The Galveston post office used the wrong year slug for several days in late May and early June 1861. 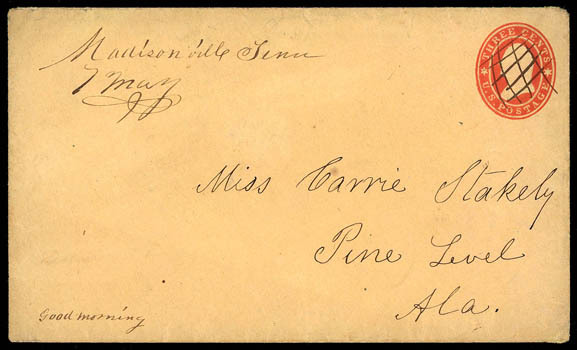 Confederacy, Madisonville, Tenn., 7 May, manuscript postmark on manuscript canceled U.S. 3¢ Star Die entire to Pine Level, Ala., Very Fine, Alabama was admitted to the Confederacy February 4th and Tennessee became an independent state a month later on June 8th. 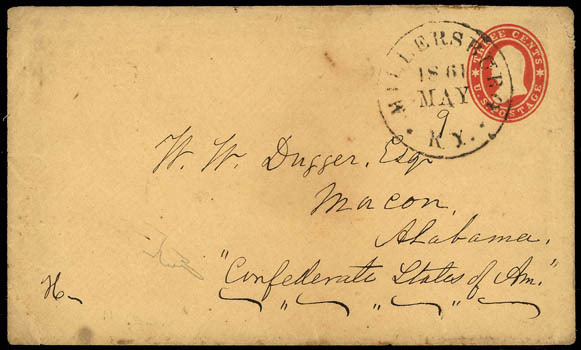 Confederacy, Millersburg, Ky., May 9, 1861, cds cancelling on U.S. 1861, 3¢ Star Die entire addressed to "Macon, Alabama, Confederate States of Am. "; small part of backflap missing, Very Fine, Alabama was admitted to the Confederacy February 4th while Kentucky eventually proclaimed neutrality on May 20th. 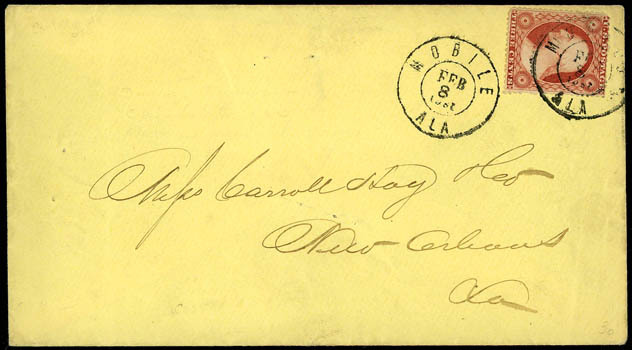 Confederacy, Mobile, Ala., Feb 8, 1861, two strikes of cds on Hoy cover to New Orleans, La., one tying U.S. 1857, 3¢ dull red, Very Fine, Alabama joined the Confederacy four days earlier on February 4th and this is the day (Feb 8) that the Confederate States of America formally established when delegates signed the Provisional Constitution. Scott No. U.S. 26 Estimate $150 - 200. Confederacy, New Orleans La. 1861 (Mar. 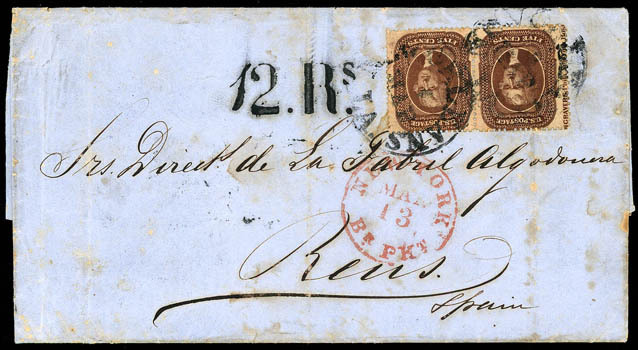 4) to Reus, Spain, blue folded letter bearing U.S. 5¢ brown, type II (30A) horizontal pair, imprint at left, tied by two strikes of "New Orleans La. Mar 4" cds prepaying double the 5¢ British open mail rate for a letter weighing between ½ to 1 ounce, red "New-York Br. Pkt. Mar 13" exchange cds (Winter 70), carried by Galway Line Adriatic from New York Mar. 16th to Queenstown arriving Mar. 23rd, red London (3.25) transit backstamp, La Junquera (3.27) entry cds and matching "12. Rs." 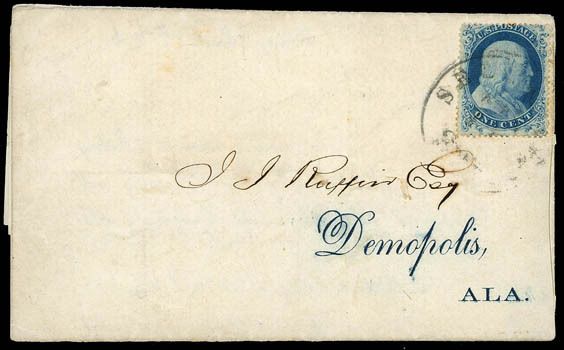 reales due handstamp, Reus (3.29) arrival backstamp. THIS CONFEDERATE TRANSATLANTIC WAS CARRIED ON THE MAIDEN VOYAGE OF THE GALWAY LINE "ADRIATIC". In March 1861, "Adriatic" (formerly of the Collins Line) was purchased by the Company. She sailed from New York on 13 March for Queenstown and Cowes carrying mails and passengers intended for the Cunard steamer "Australasian", who had turned back on her 16 February voyage to New York. Adriatic reached Queenstown on Mar. 23rd where the mails were landed, and Cowes on Mar. 24th. After arriving at Cowes early on the 24th, she proceeded immediately to Southampton where she was docked and surveyed in preparation for being placed in service as a regular Galway steamer. She arrived at Galway on 17 April and was prepared for service with the Company by expanding her passenger capacity. Since "Adriatic" belonged to the Company on this eastward voyage, her mails may be considered Galway Line letters on the Mar. 13th sailing. 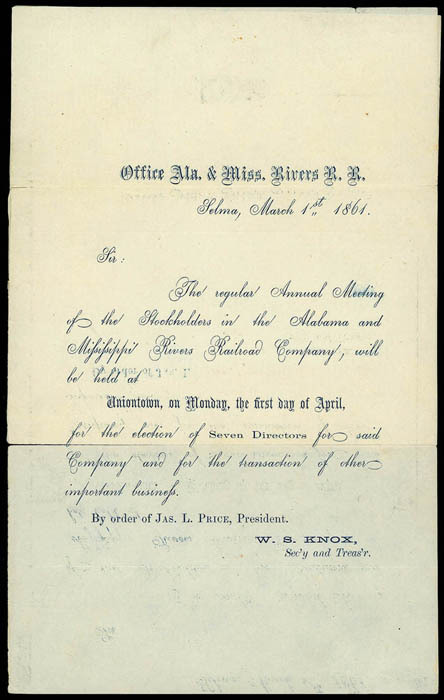 Confederacy, Selma Ala., '3 Paid', Mar 1, integral-rate cds ties U.S. 1¢ blue, type I (18) on 1861 printed circular to Demopolis Ala.; separations and missing outer bottom flap, Very Fine. A RARE U.S. USED IN THE CONFEDERACY 1¢ CIRCULAR RATE USE.